I’m SOOO excited about December Daily this year and making all sorts of plans (more on that later) but first I have to finish last year’s album. I just got the rest of my pics printed and I’m busy getting it together. I just finished this layout using the September Freckled Fawn Kit. I am loving the black and white. SO much. So much I am really leaning towards a lot of black and white for this year’s December Daily. I need to pick up some extras from this kit! I love big 6×8 pics in projects like this. When I pulled this one out of my stack I knew it would go great with this kit. I kept it pretty simple – one of the wood veneer days, a journalling spot and a vellum sticker. Easy peasy. The picture has so much impact it didn’t need much. I added in an instax picture, a tag from the ornament pictured and a couple of photos. Again, I kept it simple with washi, vellum, puffy and enamel stickers and those sweet sweet black script alphas. They’re a great way to emphasize words in journaling to create a mini title. Using this kit made it easy to get another page done quickly without compromising style. Polar Bears at the Zoo layout for April Lilli! 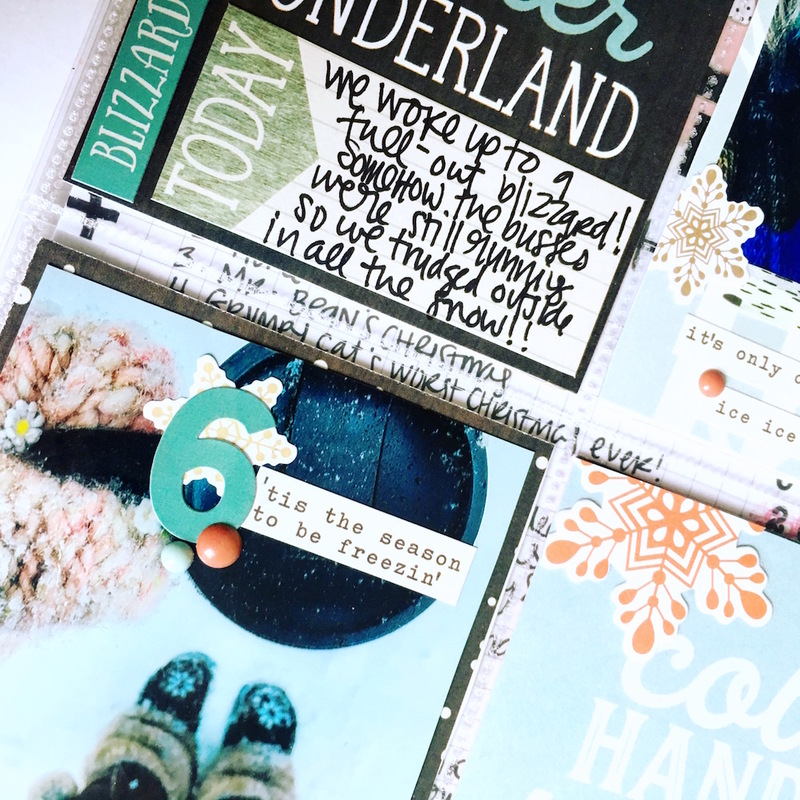 I’m back with another layout using Simple Stories Winter Wonderland from the April Lilli Shop. I used it for a second layout in my December Daily because it was just perfect for a day I took the boys to the zoo. It’s another 2 page layout with a large photo on one side and pockets on the other. This one is all about Polar Bears! Everything I used is from the Winter Wonderland Collection (which is 20% off at the April Lilli Shop for the rest of the month) except these super cute alphabet stamps from the 1 Canoe 2 Hazelwood collection and some Thickers from this set from Oh Happy Life by Amy Tangerine. I love the way this pocket turned out. I used a card cut from this 4×6 horizontal element page cut down to 3×4. Then I cut the quote out from the same sheet and made it fit into the smaller 3×4 size. Then I stamped the bit about polar bears with the Hazelwood alpha stamps because it was so much fun to see the polar bears all active in the winter! There is a divider that came with my album in the middle of the layout with some stickers from the Winter Wonderland 12×12 sticker sheet and 4×6 stickers to mark the day and the Amy Tangerine thicker that says wild because I felt it worked here. On the right side is a big focal image of two polar bears playing. We usually go to the zoo in the summer so it was really neat to see them so active! I used some of the ephemera pack, the washi, the enamel dots, the 4×6 stickers, the 6×12 chipboard stickers, the 12×12 sticker page and a few different papers from the Winter Wonderland collection to make this page. Living somewhere where it’s so wintery I just love this collection and have been using it a bunch! There are so many great elements in in and I love all the word strips and stickers! I tend to use them in place of journalling so it’s great to have so many choices. This is my first April Lilli Shop Design Team project and I was so excited to see the collection we were working with for this month! Simple Stories Winter Wonderland is just perfect because we have a lot of snowy days. A LOT. There were two winter storms in the 25 days I worked on my December Daily. December 6th was a blizzardy day and with so many snowy pictures I knew that it was the perfect day to break out this collection on. I loved the word stickers so so so much – I’ve been using a lot of word stickers with square photos mounted on 3×4 journal cards and these words and phrases felt made for these photos! I also LOVED the birch washi roll. I am going to use it a ton! The kids went off to school as their school bus somehow still ran in a blizzard and I took a snow day. It was pretty great. And after school they had SO much fun in the snow! The left side of the layout combined two of the fun 3×4 cut outs from this paper and then this paper and 3×4 cuts from the 6×6 paper pad as backgrounds for photos. I used 4×6 sticker sheets, the perfectly coordinating enamel dots, washi tape, bits and pieces and the 12×12 sticker sheet to add my own touch to it all. I used a tag from the bits and pieces to add in a bit of journalling, but for the most part it’s a lot of embellishing on this page. I <3 layers. The Cold Hands Warm Hearts journal card made me think of Friday Night Lights so I just had to add it in! And it went well with the mitten picture next to it. The right side I just focused on one big picture of my older son making a snow angel. 6×6 might just be my favourite photo size. I mounted it on the Oh What Fun patterned paper and embellished it with stickers from the 12×12 sticker sheet, washi tape, 4×6 sticker sheets and the enamel dots. I really like that faux polaroid look of a square picture on patterned paper. I stacked various words that went with the picture underneath it. The snow angel is just perfect!! And for a focal point I used the Snow Fun stickers from the 12×12 sticker sheet. I love how well the Simple Stories Winter Wonderland collection goes together. I see myself using it a lot over the next million months of snow! And for the month of January it’s all 20% off at the April Lilli Shop! So if you know me, you know I LOVE Christmas. And one of my favourite Christmas things to do is document the whole season in a December Daily album. In the December Daily community there is a lot of talk about starting with “The Reason Why” or an “Intentions” page but that doesn’t really feel me. Sure I could write a bunch, but starting an album that will probably end up being super visual with a wall of text that I’d write for the sake of it feels inauthentic to me. I’m not saying you shouldn’t – It’s a beautiful way to start an album with a lot of sentiment and I love seeing them, but it’s just not me. The other day on the bus home from work I was listening to The Scrap Girls December Daily Podcast with Brandi Kincaid and she talked about how she started her albums with a sort of wish list of things she wanted to do over the holiday season. I just LOVED that idea. When it comes to intentions and reasons all I can think of is “because I <3 <3 <3 Christmas, duh” but a wishlist? YES! I was inspired that night to sit down and make a rough list as seen at the beginning of the post. I then took a few of my favourite things. Number stickers, shiny washi, hot pink heart stickers and tag, some black and white ribbon and my very favourite alpha stamp from Kellie Stamps – Slim Jim (which is back this month!!). I started by stamping the tag. I also used the Joy Clear Stamp from Kellie Stamps because I loved the script and hashtag stamp. I then started working on my list. I picked some words to highlight in my list and stamped those down and started working around them. I really like the way the stamped words highlight some things that get me so excited about the season. This way of starting my album makes me smile so much! It’s full of experiences I can enjoy with my family during my favourite season of the year when everything just seems so magical and bright.